Pennsylvania is the poster child for gerrymandering. The original gerrymander, from an 1812 political cartoon. 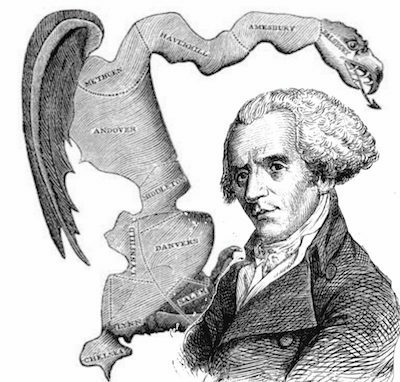 In 1812, Massachusetts Governor Elbridge Gerry backed a redistricting plan favoring his party, with one district so convoluted that it looked like a salamander. We’ve been calling the practice of manipulating electoral maps for political advantage gerrymandering ever since. Pennsylvania is widely known for its gerrymandered districts—in fact, in 2016, researchers at the independent Electoral Integrity Project gave our redistricting practices an 11 out of 100—the third-worst rating in the nation. We’re a national target: We’re one of only a few populous swing states, our districts are more likely to be redrawn because of population changes, and our districts are already gerrymandered. Lobbyists from parties and outside interests target us because they know it will have a big impact. Big data and mapping technology are now available: Politicians can now use sophisticated mapping technology and surgically precise data to pick exactly who they want in or out of a voting district. Campaigns are fueled by outside money: Thanks to the Citizens United Supreme Court ruling and our state’s lax campaign finance laws, outside interests are pouring money into local elections, particularly with aggressive, negative campaigns. In a fair district, which gives voters real choices at the ballot box and ensures that politicians are accountable, district lines are drawn to reflect community borders and natural boundaries (like rivers or mountains), and to create an accurate depiction of the population. But our districts aren’t fair. Instead, politicians use several tactics to draw lines that will ensure they keep their seats, and keep their party in power: cracking, packing, sweetheart gerrymandering, and prison-based gerrymandering. Cracking reduces the voting power of a certain party or community by splitting its population and spreading its members among several districts where they become an irrelevant minority. Packing concentrates voters of one party or community in as few districts as possible to reduce their influence in the remaining districts. Sweetheart (also called incumbent or bipartisan handshake) gerrymanders are designed to protect incumbents of both parties. It’s a tacit deal between parties to keep to the status quo—regardless of what voters want. Prison-based gerrymandering counts incarcerated people, who are not allowed to vote, in the district where the prison is located, rather than in their home districts. This gives voters from districts with large prisons more influence than they should have. 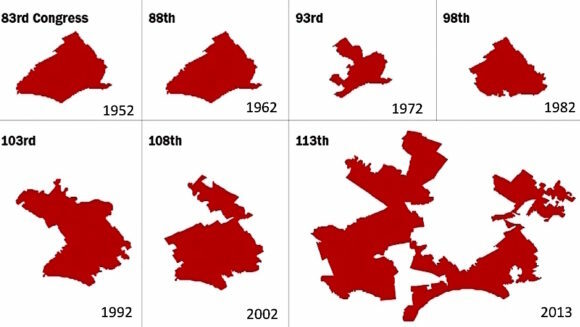 Consider Pennsylvania’s 7th Congressional District, nicknamed “Goofy kicking Donald.” It’s regularly described as one of the most gerrymandered districts in the country. The problem isn’t just its odd shape. When you look at District 7 alongside Districts 6 and 16, you see a prime example of cracking: The lines spread poor urban communities out among suburban and rural areas. For example, Reading is the fifth largest city in Pennsylvania. The lines are drawn to put Reading voters in the same district as Lancaster farmers. We can’t directly link lack of representation and issues like poverty and low school funding, but it’s interesting to note that Reading is currently the poorest community, with the most underfunded school system, in the U.S.
You’ll find similar stories across Pennsylvania. Follow the odd little squiggles, and you will see communities and counties divided, and voters deprived of choice and voice. By targeting key state legislative races in 2010, Republicans gained 675 legislative seats, and gained control of 12 state legislatures. The result: Republicans got to redraw four times as many congressional districts as Democrats. If we don’t change the law, both parties will try to do it again in 2020: the Republicans with REDMAP 2020, and the Democrats with Advantage 2020. We don’t have to let them. Bills have already been introduced in the PA House and Senate to establish an independent citizens commission, which will draw equitable lines that reflect real communities, free from partisan and financial influence.